After high school he won scholarships to the Art Students League, where he studied briefly with Yasuo Kuniyoshi, and to the Rhode Island School of Design in 1946/ At RISD the emphasis was on the new aesthetic of Modern Art, but Schwartz was less interested in Cezanne or the Cubists than in Manet and Toulouse-Lautrec. Drawing from nature liberated him, and paradoxically, so did a growing fascination with postwar changes taking place in graphic design. He decided he was more suited to the field of illustration. After graduation in 1949, he returned to New York where, on the strength of his redesign of the RISD yearbook, Bradbury Thompson recommended him for an entry job in a small graphics firm. A few unhappy weeks in he bullpen convinced him that his efforts should be trying his hand as a freelancer. He landed a commission for a book jacket and for the next several years he made a living depicting “nubile ladies in various stages of undress teetering on the brink of violation,” while painting for himself at night. By 1952 Schwartz had saved enough money for a trip to Europe where, he says, he saw “the mind-blowing old art at the heart of Western culture that only strengthened my conservatism.” In 1954 he joined the Davis Galleries to show his paintings with like-minded realists. Schwartz’s first one-man show in 1955 received good reviews and in 1956 he won the first of two Louis Comfort Tiffany Painting Grants, enabling him to return to Europe and live in France for an extended period of time. 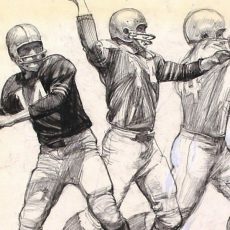 Jerome Synder; the gifted art director of Sports Illustrated, was a longtime fan of the Davis Gallery artists and in 1959 he persuaded Schwartz to illustrate articles for the magazine. His involvement with athletes led to numerous paintings on the subject, which were exhibited at the Davis Gallery in a show called “On a Sports Theme.” In 1960, Esquire offered Schwartz a commission for a series of illustrations which, added to several large, previously exhibited works, resulted in a major article. This impressive format generated excitement and led o similar assignments from McCall’s and Fortune, then from Redbook and Time. The artist looks back on the sixties as a golden period for magazines, a time when brilliant editors wanted to do brilliant things, when Schwartz “saw the opportunity of making magazines a virtual gallery.” For the next two decades, Schwartz’s extraordinary and multifaceted skills were utilized in cover portraits, annual reports, reportage for CBS and assignments as the Mobil Oil artist-in-residence in Southeast Asia. His work was recognized in many Society of Illustrators Annual Exhibitions, the coveted Gold Medal awarded to him eleven times.